Moving out of the family home can be an arduous affair for aging parents. If you want to move your parents to a nursing home or are considering assisted living, then it is important to focus on the long term goal. You do not want to be moving them twice in a short span of time as it will be very hard on you and your parents, both physically and emotionally. Therefore, you need to weigh your options between assisted living vs nursing home with a long term view of what is best for your parent. Want to find the best facility for your parents but hesitate between assisted living and nursing home? Know their difference and make better options. Nursing homes: In a nursing home, aging parents usually sleep in a hospital style room that is often shared. They also have communal dining and living areas. Excursions and activities are not a primary feature of these homes since residents are more often than not cognitively or physically unable to take part in. Assisted living: In this set up, your aging parents will live in units that look like apartments. They can furnish and decorate the units themselves. They can opt for a studio apartment, a cottage, or a one-bedroom unit. Some of the units even come with kitchenettes with a refrigerator and a microwave. The setting feels a lot like home with residents involved in community activities that include exercise, art classes, local excursions and holiday celebrations. Nursing Homes: These homes are primarily meant for seniors who require medical care. They are best suited for seniors who suffer from medical conditions that need constant monitoring. Such conditions include sever heart disease, dementia and any other condition that requires constant tweaks in medication dosage. Nursing home has most of the needed medical facilities and medical team. Assisted Living: These are non-medical care facilities that focus on providing a vibrant and healthy social environment that encourages interaction and great cognitive health. 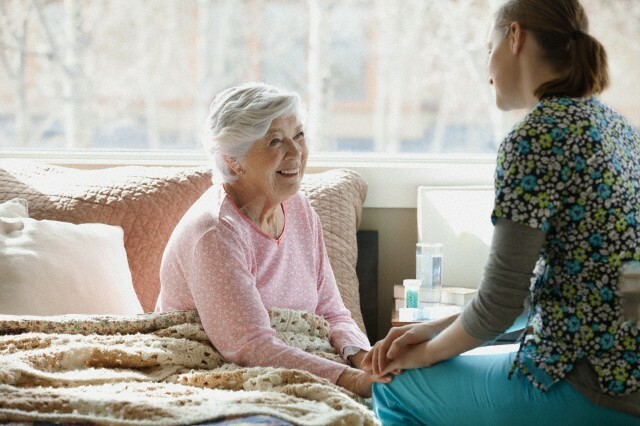 Residents normally do not require assistance for day to day activities such as bathing, dressing and medication, which are provided in nursing homes. If you’re contemplating assisted living vs nursing home, you need to realize that the biggest difference between the two is that assisted living only provides minor medical supervision while nursing homes provide extensive medical care. As you weigh your options, you should know that assisted living facilities are not compelled by law to have a licensed nurse. Even if they have a professional nurse, the nurse can't give hands-on care to the senior on issues deemed as skilled nursing care by the federal government. The staff members of an assisted home are not necessarily registered nurses. Registered nurses and licensed practical nurses are accessible and on call but are not available on site. Nursing homes have license practical nurses on duty around the clock. The law requires that a registered nurse should be on duty 8 hours a day, 7 days a week. On average, nursing homes cost twice as much as assisted living facilities. Costs range from $2400 in Georgia and $4950 in Massachusetts per month for assisted living facilities and $4410 in Oklahoma Missouri to $11,710 per month for nursing homes. As for insurance, most nursing homes are certified to participate in Medicaid, Medicare or both. Medicare does not offer cover for assisted living facilities. However, some assisted living services are covered by Medicaid programs. Eligibility requirements and costs vary widely, so you’ll have to dig deeper in order to weigh the cost implications of assisted living vs nursing home. On average, 79% of those in nursing homes are admitted at the age of 79 while those in assisted living are admitted at 86.9. Man and woman ratio: There are generally more women than men in assisted living and nursing home. Women form about 70% of nursing home residents and 74% of those in assisted living facilities. Regulatory authority: Nursing homes fall under the department of health while assisted living facilities are under the jurisdiction of the state department of social services. You need to remember this as you compare assisted living vs nursing home options for your elderly parents. After you have made your decision between assisted living and nursing home, you need to establish which facility will best meet the needs of your loved one. Below are some tips on picking the best establishment. After you have made up your mind on nursing home vs assisted living, you need to pick a facility that is convenient for both you and your loved one and close enough for other family members to make visits. Is the place clean? Don’t just look at the furnishings. Check out corners, windows and baseboards. Ask how often housekeeping is provided and the laundry procedures. Get an itemized list of what is available and at what cost. Look out for odors as they may be a sign of a problem or a lack of cleanliness. If you detect a problem, ask the manager what they think about it before making any conclusions. It is important to check on the friendliness of the members of staff. The comfort of the residents largely depends on how they relate with members of staff. For this reason, you should observe staff interaction with residents. Do they make eye contact? Do they listen? Make a point of meeting the management to understand their motivation for running the organization and their goals. The dining experience is crucial for your aging parent. Take time to sample the meals of the establishment. Visit the facility with your loved one and have a meal at the property. It not only tells you the taste of the foods but also gives you a great opportunity to talk to others and find out what happens if a resident is unable to make it to the dining room for meals. If your loved one has any special needs, you should make sure that the facility can cater to their needs. For example, they might need specialized respiratory care. Ask detailed questions to find out whether they can meet all the special needs. Make sure the facility has taken adequate measures to guarantee the safety and security of your loved one. For example, check that bathrooms are easily accessible and have grab bars. Find out how residents get the attention of staff when there is an emergency. You can talk to residents, families and even workers to find out what they think about the facility. You can also get reviews for various facilities online. This is probably the best way to determine whether the facility is right for your loved one.